Hello everyone! Are you ready for Christmas in just 3 days? I'm so excited!! If you're confused as to why I'm writing about a first year seminar even though I'm a sophomore, no worries! As you may know, I took Horses & Healing last year as a first year, and this past semester I was lucky enough to be a Teaching Assistant (TA) for the class along with four other girls who I have absolutely loved working with (shout out to Alex, Lauren, Meaghan, and Devan)! Horses & Healing was one of my favorite classes last year. I first heard about it in the New Student Guide I received in the mail after I officially decided on Saint Mike's. There was not one class I wanted to take more than Horses & Healing. Unfortunately I didn't get into the class on registration day, so I emailed the professor, Bridget Kerr, to be put on a waiting list. I still hadn't gotten in when I arrived on campus last fall, so I talked to my academic advisor and he suggested I go to the first class meeting and see if there might be any space. I went with Alex, who was also on the waiting list and really wanted to take the class. Luckily, when we got there, there was one open spot and Bridget, seeing how much we both wanted to be in the class, decided to make an exception and allow both Alex and I to take the class. I could not be more grateful! While the main focus of first year seminars is on solidifying writing skills, a huge part of the course is the service learning component. Everyone who takes Horses & Healing gets the opportunity to go off campus once a week to a barn called Champ in South Hero. Champ has many therapy horses and depends on volunteers to keep everything going smoothly. They are always so grateful to have Saint Mike's students come help them out. This year, both sections of the course went to the barn at the same time. Once we got there, the general protocol would be to meet as a group to discuss our tasks for the time we were there (an hour and a half) and then split up into our "barn groups," each of which had a TA leader. Usually one group would get the opportunity to help out with a lesson by being a sidewalker or helping the rider get on the horse. 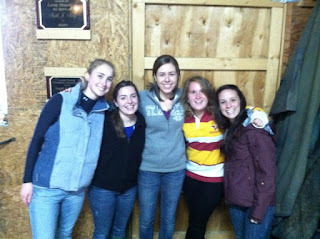 My group ended up in the Champ barn a lot, where we mucked in and around the barn. It might not sound fun to some, but we always had a good time with it! Sometimes we would have some downtime where we would get to play with the horses or talk about things like registering for classes or just general topics about Saint Mike's. Because each TA was assigned to a specific work group, I was able to get to know the students in my group. 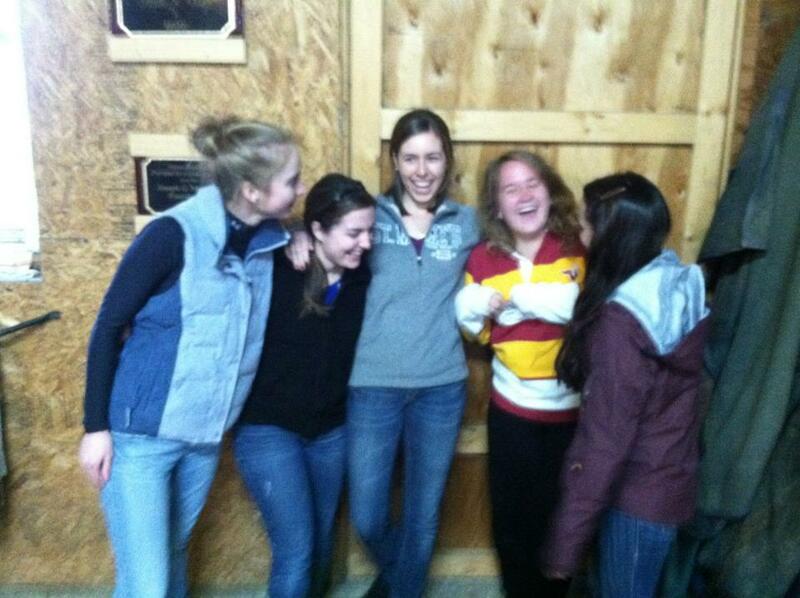 I loved this aspect of going to the barn because, as you may know, I love giving advice and sharing my opinions and awesome experiences about Saint Mike's! In addition to getting to know the students in my group, I definitely felt closer to my fellow TA's as the semester progressed. We always had tons of fun on the bus rides to and from the barn, and we even had a few "TA Sloane Dinners." Sloane is the cafeteria on SMC's North Campus (where I live this year), about a mile up the road from Main Campus. Sloane is only open for dinner, but it's especially fun because it's set up like a restaurant - everyone sits down and indicates what they would like for an appetizer, entree, and dessert, and the food is great! My fellow TA's and I always had a great time. I absolutely love my group of friends at SMC, but it never hurts to have more. I'm so happy I got to know these girls better this semester! I could not be happier to have had the opportunity to be a TA this semester. Alex, Lauren and I had a meeting with Bridget (who teaches the class) before we left for break to talk about how smoothly everything went. She even wants to have us over to her house for dinner sometime in the spring - I'm so excited! So, if you decide to come to SMC next year (shout out to everyone who recently received acceptance letters!) and you're interested in horses or service learning, I definitely recommend taking this course - you will love it! As always, thanks for reading my blog! Have a great weekend! And if you still have some last minute Christmas shopping to do, good luck!